In the Avengers: Infinity War footage that was shown at Disney’s D23 Expo and the Marvel panel at San Diego Comic-Con, we got to see a very small glimpse of Thanos’ Black Order. 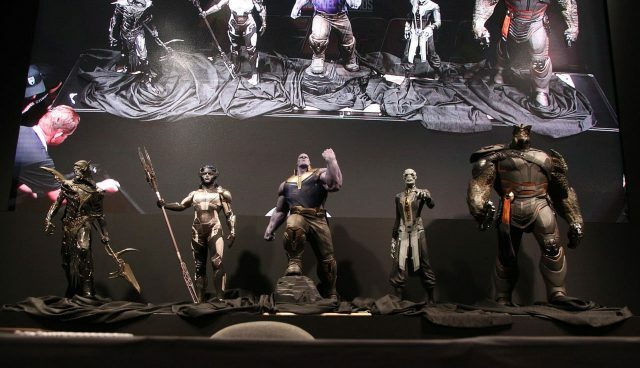 Fans got a look at some statues from the film at D23 and there were four members of the Black Order on display. We got a chance to chat with co-director Joe Russo about where the fifth member was and why he chose to bring these newer members of the Marvel Universe to the big screen. If you’re not familiar with the Black Order, they’re henchmen of Thanos who were introduced fairly recently in the Marvel comics, in 2013 in New Avengers Vol. 3 #8. The Black Order’s members include Black Dwarf, Corvus Glaive, Ebony Maw, Proxima Midnight and Supergiant. Supergiant, however, was missing in the look we got at D23. The Avengers sequel sees Earth’s Mightiest Heroes teaming up with the Guardians of the Galaxy to take on Brolin’s Thanos. Confirmed cast members for the film so far include Robert Downey Jr., Chris Evans, Mark Ruffalo, Scalett Johansson, Chris Hemsworth, Anthony Mackie, Paul Bettany, Elizabeth Olson, Chadwick Boseman, Sebastian Stan, Don Cheadle, Chris Pratt, Dave Bautista, Zoe Saldana, Pom Klementieff, Benedict Cumberbatch, Benedict Wong, Sean Gunn, Tom Holland, Josh Brolin, and Paul Rudd. Marvel’s Avengers: Infinity War is slated for a release in theaters on May 4, 2018. Then, the Avengers assemble again for the still-untitled fourth film, set for May 3, 2019. What do you think about the inclusion of the Black Order? Let us know in the comments or tweet us @ComingSoonnet.